This is a story which all began in March of this past year. I was new to Instagram and just happened to start following the actress Sarah Jessica Parker on her birthday. On that day, she posted this charming photo from 1958 of a model wearing a Christian Dior gown. The photo was taken by Sabine Weiss. I absolutely fell in love with everything about this image. I was sleeping one night and the connection between this vintage photo and Sarah Jessica may have come together in my subconscious brain or something. 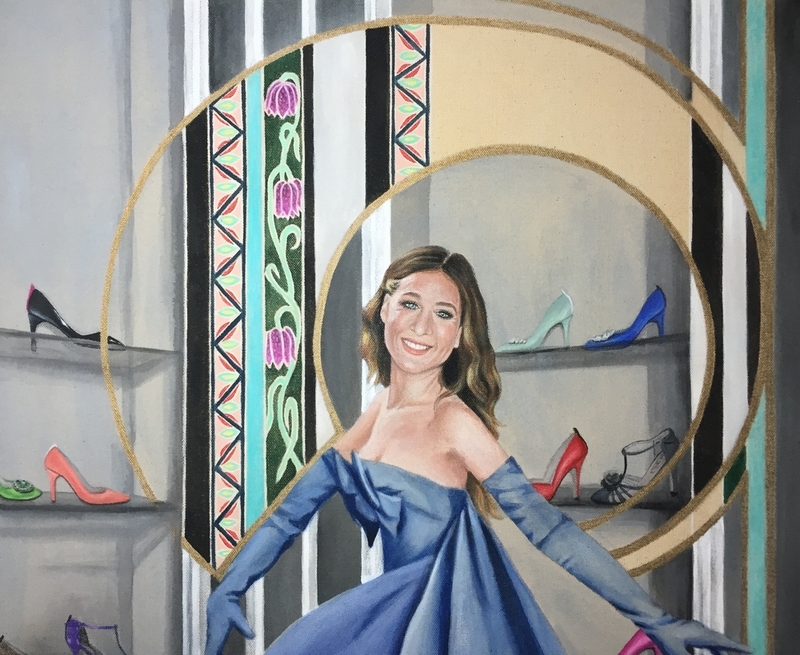 A vision woke me up of Sarah Jessica being the girl in the photo with all of her shoes from her SJP shoe collection surrounding her. I sat up in bed with inspiration swirling around in my head. Night time is usually when I have the clearest sources of inspiration that I later use when I sit down to paint. I decided to go with what I saw that night and paint what I had envisioned. 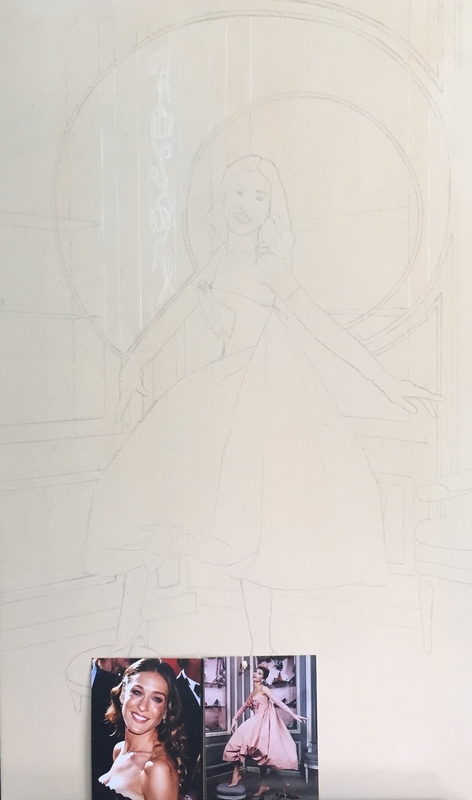 I primed my piece of canvas and couldn't wait to get started! 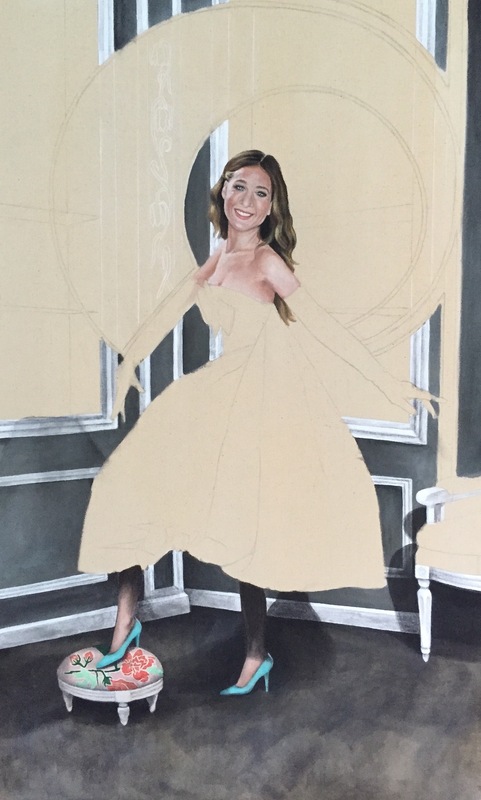 First I drew out the placement of Sarah Jessica and the background. I found a photo of Sarah Jessica to use as reference that was the best match for the direction of her head and neck. 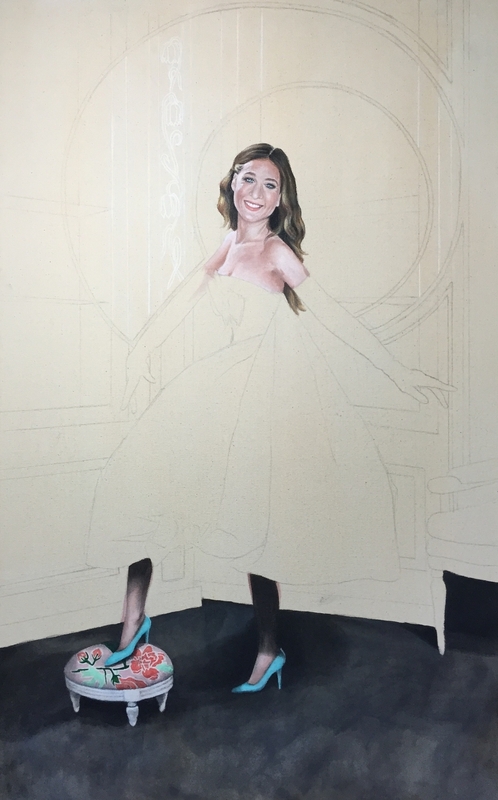 Once I attained her likeness, I moved on to the floor, legs and feet, and walls. 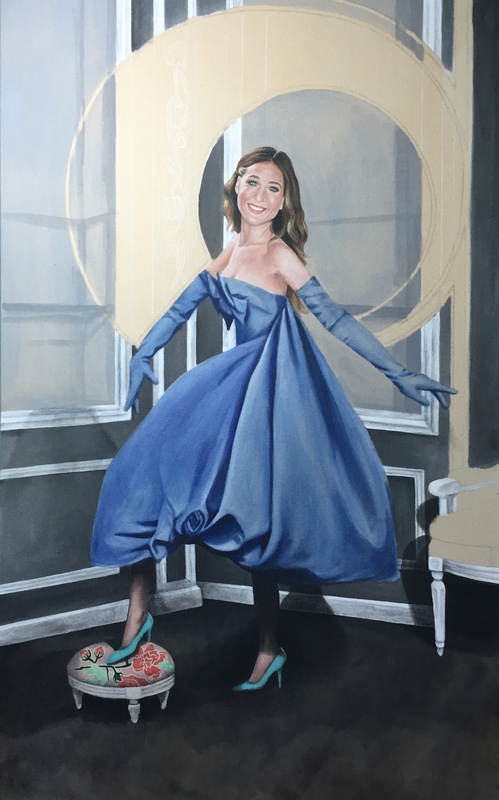 I contemplated what color I should paint her dress, and landed on this beautiful blue. 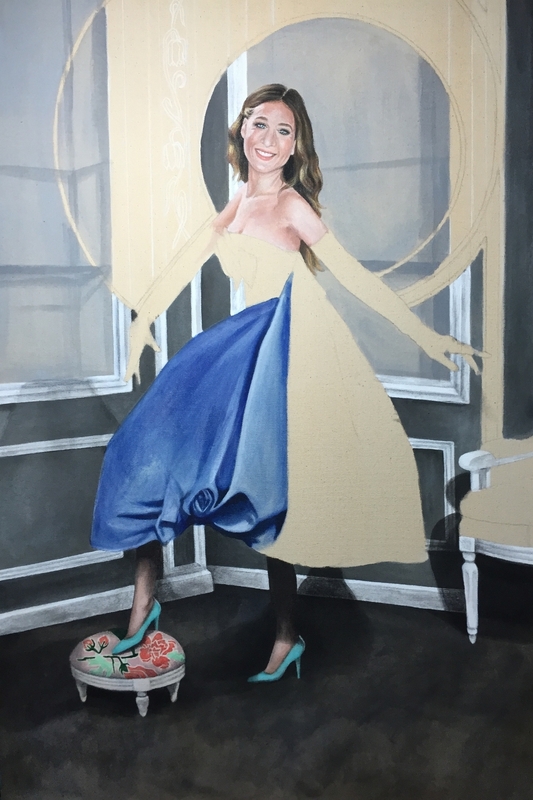 Painting the folds of her gown were so exhilarating to me (I know I am a weird). The shoes were like the icing on the top. 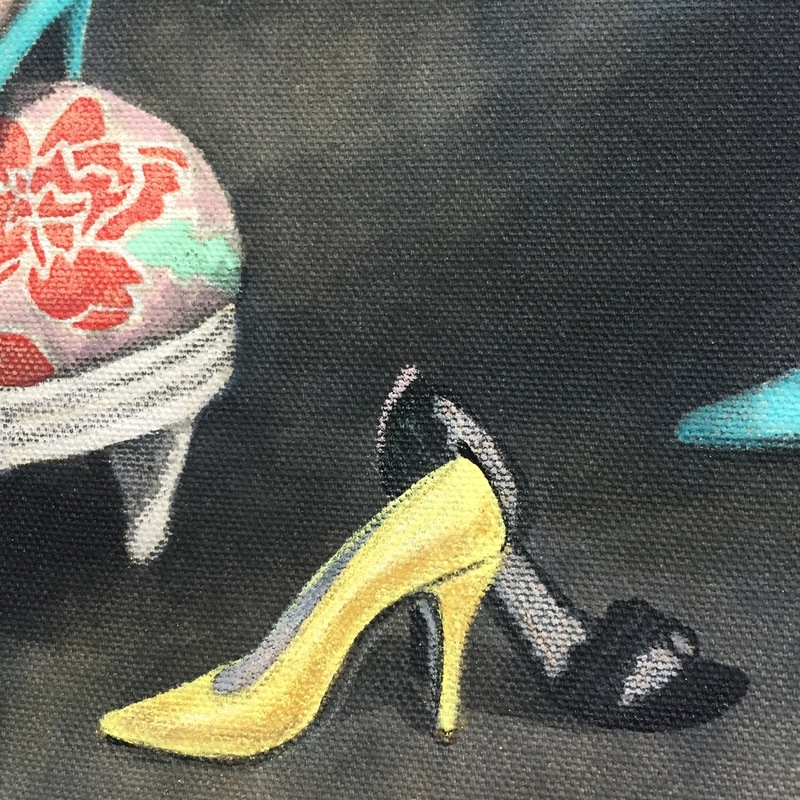 I painstakingly searched for the perfect shoes from her collection to add into this painting. It was harder than I thought it would be to pick the right colors and styles that would make a good color scheme. 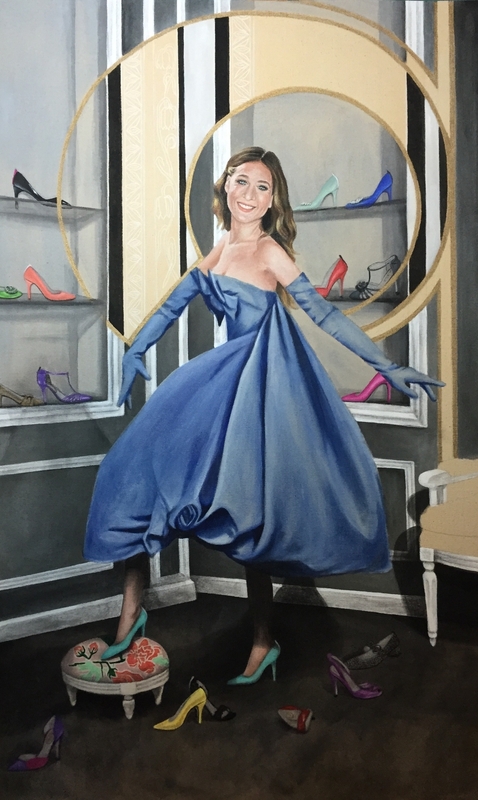 It was difficult not to include all of her shoes, but if I did that, there would have been no place for the beautiful Sarah Jessica Parker! 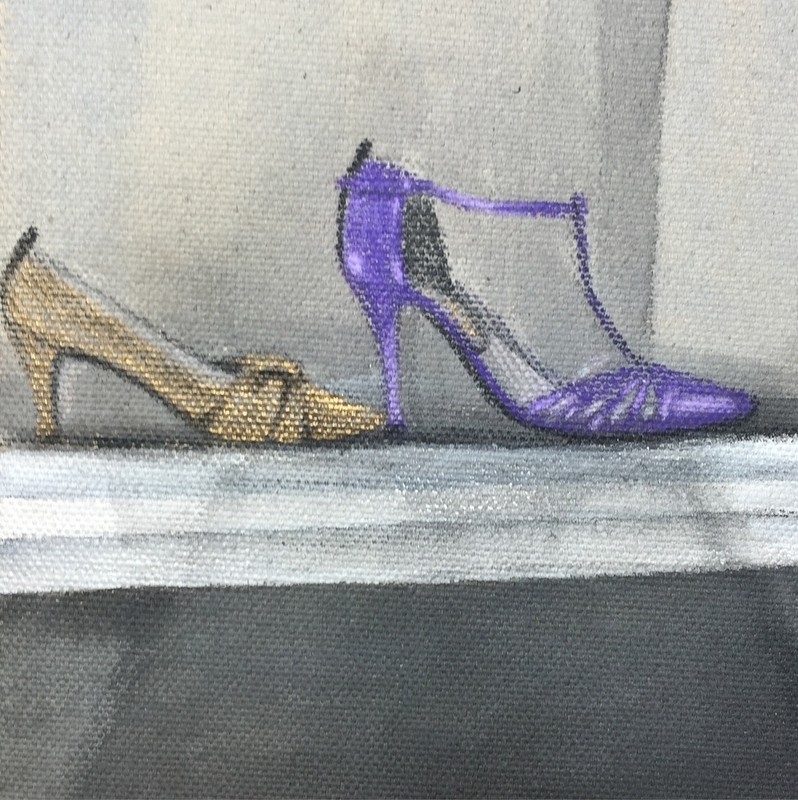 As I painted these shoes, I just fell in love with them. I love the strip of complimenting color that graces the backs of their heels. The sparkle emanating from some of the shoes make them (in Sarah Jessica Parker's words) "the modern day glass slipper." They all have their own distinct personalities and I enjoyed painting every one of them! Lastly, I painted the designs in the background which helped create movement and energy in the painting. I feel like the designs compliment the shoes and really help tie the whole piece together. I enjoyed every part of doing this painting, but when it was all finished in August, I felt that it didn't belong with me. It belonged with the one person who would appreciate it most, but I had no idea how it would ever be possible to give it to her. A couple of weeks later, I saw that an art exhibition was going to be at the Metropolitan Museum of Art in New York City that I really wanted to go see. It was a huge collection of John Singer Sergeant's works all in one place. He is a portrait artist that I have always loved and I thought that this would be an awesome and inspirational exhibition for me to see in person. It had been a couple of years since I had traveled to New York and I was ready for an adventure and determined to get there. I found a few other girls interested in joining me and within a week we coordinated a day when we were going to drive to one of the greatest cities ever, see an amazing exhibit, and drive home the next day! I know people thought we were crazy, but I would have driven there for even a couple of hours! A week before we were scheduled to go, I saw a post on Sarah Jessica Parker's Instagram saying that she was going to be at the Bloomingdales in NY making an appearance and selling shoes from her collection! I looked at the date and she was going to be there the day after we were leaving to come home. I couldn't believe it. We were going to miss her by one day, but I was determined to find a way to get my painting to her because it seemed like too much of a coincidence for me not to try! I emailed Bloomingdales and asked them if I could leave the painting at their store overnight so that she could get it the next day. They told me that there was no secure place for me to leave my painting overnight. Dead end. The end. No, not really. I am a fighter and someone who likes a good challenge. So when I have a road block in front of me, I am more determined than ever to find a way to accomplish my goal. So a couple days before I was scheduled to leave for NYC that is when it all came together. Through God's help and some amazing contacts, I now had made arrangements to drop this painting off on my trip to NYC! The seemingly impossible was now possible and I was excited to say the least!! While hailing a cab with one hand and the other clutching my carefully wrapped painting, I felt that I was in a dream. What all started with some inspiration from a beautiful image, then a vision one night, some hard work and determination, prayer, and now an open door, had led me to this moment in time. All sorts of thoughts were going through my head in the elevator if you can only imagine. The grand finale... going to the SJP collection offices/ show room and handing over this gift that felt like a piece of me. But knowing it was literally safe in her hands and surrounded by the very shoes featured was worth giving it up for! This was an experience I am so thankful for and one I will never forget. THE END.